This book is for beginners of Telugu blogs that did not otherwise have a knowledge of blogs. It guides them through the process of creating a blog and then writing posts. This book also goes on more deeper with technical topics like formatting, uploading images and videos, themes, blog aggregators, etc; and social topics like Telugu blogospehere, advantages and drawbacks of blogging, dealing with comments, and things to be taken care when blogging. This book written by Sujatha (manasulo maata) and Rahman (sataanveshana), both well-known Telugu bloggers. 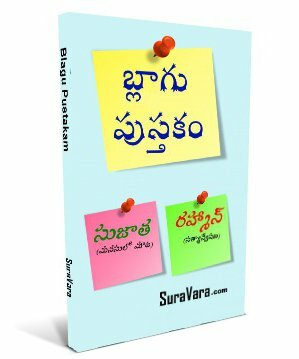 Venu did a thorough review of blaagu pustakam on his Telugu blog. It gives nice overview of the book. SuraVara Keyboard is a physical keyboard for your computer. It comes with Telugu characters on keys. So, you can type in Telugu directly without need of any transliteration or phonetic scheme in the middle. SuraVara Keyboard follows the InScript Keyboard Layout, and I recommend it. See various ways how you can buy this keyboard for yourself or gifting others.